fanaddict: Sports Illustrated jinxes the team (player) on the cover, It's true!!! Sports Illustrated jinxes the team (player) on the cover, It's true!!! Sports Illustrated is a good magazine, don't get me wrong. But there's a problem with releasing weekly magazines for sports: sports headlines are always changing. Just look at Yahoo! Sports. Their front page changes several times each day. Why? Because sports are constantly changing. 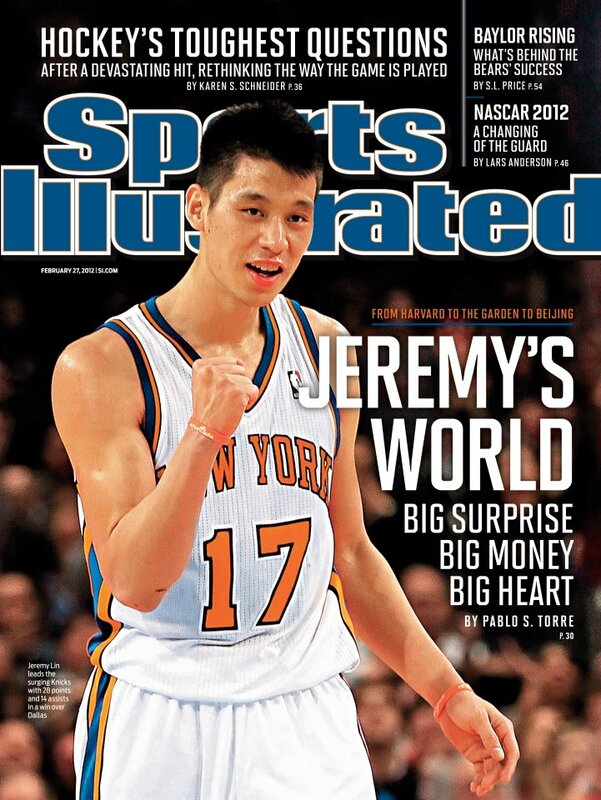 Just look at this week's cover: It's the rising sensation for the New York Knicks, Jeremy Lin. Lin is a great basketball story and he's been a reason for the Knicks recent success, but today against the Heat, Linsanity was hushed and held to only a sniffle as Miami ran them out of the building, 102-88. Lin was Linane as he went 1-11 shooting. Why? For many reasons: the Heat are a good team, he was probably sick, and because he made Sports Illustrated's cover for the second week in a row! This is what SI does. Since a magazine is obviously not the internet, there is no constant feed of information to change what's been done. Once a magazine is printed, those headlines have been set in stone (or ink). 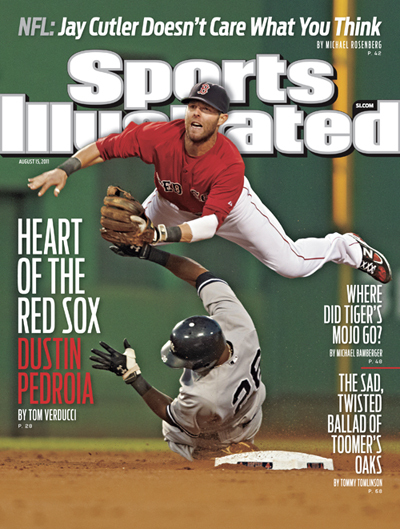 Here are a few jinxes from SI in recent memory. No other sporting event has more coverage than the Super Bowl and no other team had more SI coverage than the New England Patriots. During the two weeks leading up to the Super Bowl, the New England Patriots made the SI cover, twice. One with Tom Brady and one with Robert Kraft. The Patriots ended up losing by a few inches when they had a great chance to win the game. Why? As Eli Manning said: "I'm not superstitious, but I am a little-stitious." The Green Bay Packers... now they're a team that could handle all the hype about being undefeated, but wait a second they went 15-1... well they were a team that could handle the playoff pressure, but wait they lost in the first round to Eli Manning's Giants... Well they certainly did live up to the hype of an explosive regular season offense after the SI preseason NFL preview magazine that featured the Packers on the cover. They carried that hype all the way to Kansas City, where they suffered their first loss. But hey, no jinx, right? Wrong! They made the cover for the NFL playoff preview issue and ended up losing to the New York Football Giants, the eventual Super Bowl champs. I guess you can see why I'm a little-stitious, right? You're probably starting to think one of two things: this is kinda like the Madden curse, or Eli Manning is always involved in these issues. Well, it's kinda like the Madden curse and I only wrote this post because everyone in sports is a "little-stitious". Just look at Tim Tebow. That throwing motion screams "losing! ", but Timothy managed to pull off a few miracles with that south-paw sling. One miracle includes the Chicago Bears win where Tebow led the Broncos to FG range twice and won 13-10 OT after being down 10-0 late in the 4th quarter. Once the Tebow train picked up speed with this winning streak, it was slammed to a sudden halt by the Brady bunch. Pray that you don't make the cover of Sports Illustrated. The now-evident Sports Illustrated curse differs from the Madden curse for one reason: SI covers all sports. This includes a curse for the Boston Red Sox. The Red Sox were a victim of one of the greatest collapses in regular season sports as they choked towards the end of their season and let the Tampa Bay Rays miraculously leap-frog them in the Wild Card standings. The collapse was so dramatic that a week before, poster and bus signs were put up for the Red Sox in the post season on TBS. They lost their slipping hold on the Wild Card berth as Jonathon Papelbon, the beloved closer of the BoSox, blew a save to the lowly Baltimore Orioles on the last day of the regular season. That blown save capped off one of the greatest collapses in all of sports.